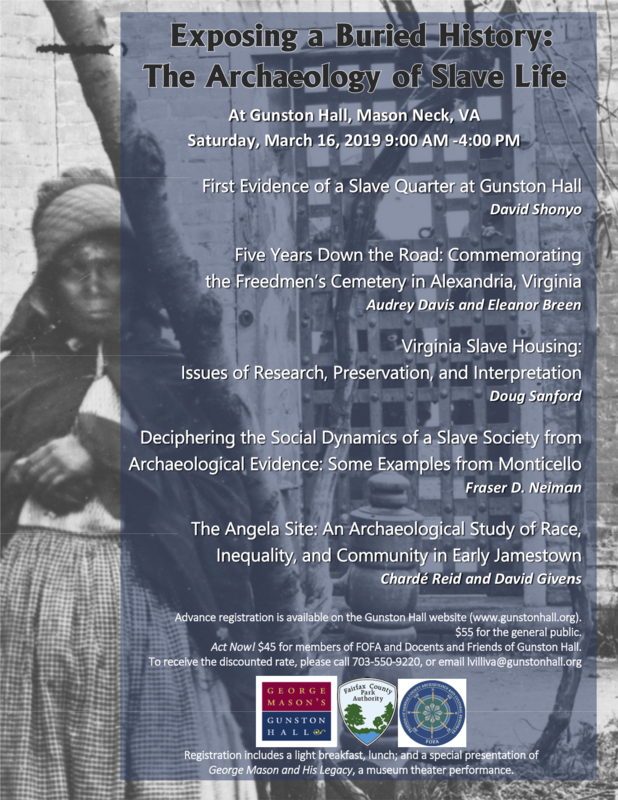 On March 16, FOFA is co-sponsoring with Gunston Hall Archaeology Symposium - Exposing a Buried History: The Archaeology of Slave Life. On February 2, 2018, 33 people enjoyed hearing Mike Clem discuss the history & progress of the Eyreville project. In the spring of 2017, DHR archaeologists and volunteers from the Archeological Society of Virginia began working at Eyreville in Northampton County on the Eastern Shore of Virginia. Work was concentrated around a hole created when a tree stump was removed. In that hole, the landowner found ceramics, pipe bowls and stems, coins, and other artifacts, including several yellow “Dutch” bricks, suggesting an early colonial home. It appears that the feature revealed by the hole was an early 17th century cellar! Archaeologists have now found at least two possible houses at Eyreville: one from the earliest occupation and one from the later part of the 17th century. They also have found other remnants of additional structures in the vicinity of both features but have not examined them in detail. They have high hopes of uncovering many more features in future excavations. FOFA will hold a brief meeting prior to the presentation in order to elect new officers to the Board. Coffee and light refreshments will be provided during the meeting. Support FOFA by buying a T‐shirt at the meeting! Approximately 40 people heard Dr. Stephen R. Potter talk on Bison in the East: A Story of Pigs, People, and Pigeons at the FOFA annual meeting on 18 November 2017 held at Frying Pan Park. 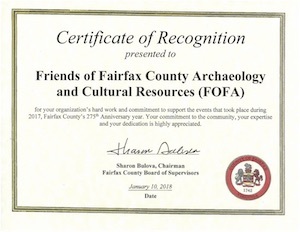 FOFA was established in 2010 to support the understanding and appreciation of Fairfax County's archaeology, artifacts and museum objects, and historic buildings. Everyone is invited to attend our general membership meetings. 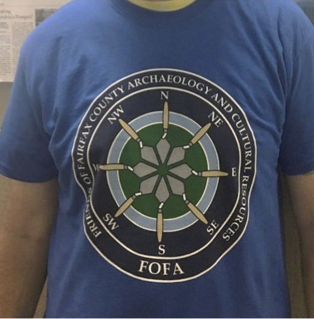 See FOFA's Events for the latest info about which archaeologist is speaking, and when! FOFA encourages its members to volunteer their time. So whether you're interested in being outdoors digging, or indoors processing artifacts or documenting museum objects, check out the Volunteer Opportunities. Keep up on what's the latest with FOFA by following us on Facebook, and by reading The Scoop (FOFA's e-newsletter). FOFA is a 501(c)(3) non-profit organization. FOFA is a friends group to the Fairfax County Park Authority's Cultural Resource Management and Protection Branch. FOFA is a not-for-profit 501c(3) organization.